Getting to Venice from Ljubljana took a lot longer than expected. Due to reasons unknown there is no direct train line between the two cities. Subsequently Chris and I had to take a train from Ljubljana to a small town called Villach just across the border in Austria. Upon our arrival we discovered that the all the coaches to Venice were fully booked for the next four hours. Neither of us much fancied walking around Villach, especially when you are carrying your life in a large backpack, so we spent the duration sat in the train station drinking crap coffee and eating expensive sandwiches. Following a further four hours on a coach we arrived in Venice. 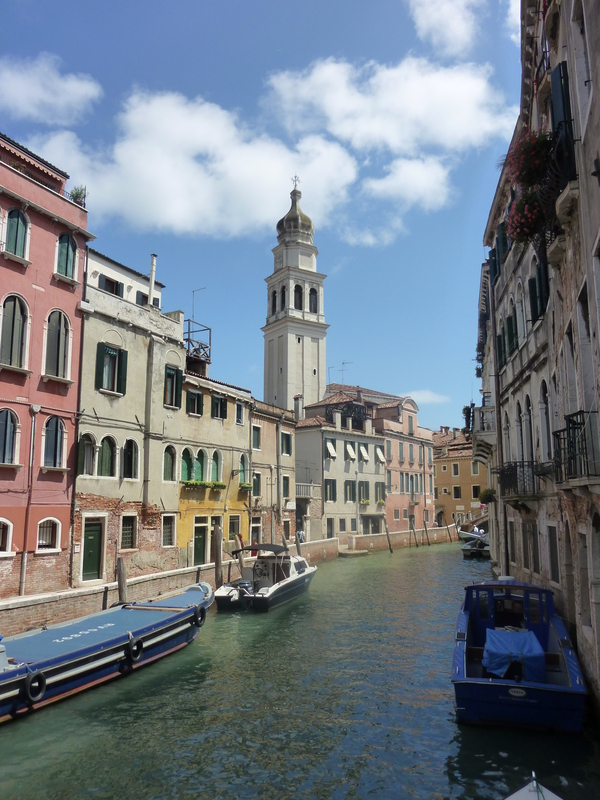 We had booked to stay in Ostello Venezia which is on the island of Giudecca rather than the main part of Venice so we had to take a boat there. Like everything else in Venice the boats are pretty expensive, €18 for a 24 hour pass. Not all that great when you only plan on using in a handful of times. First impressions of the hostel weren’t all that great. The staff seemed pretty indifferent to our presence and there were only two showers on our floor. There was also a 9pm curfew although this didn’t seem to be very rigorously enforced. On a positive note they did offer pasta and pizza for dinner in the hostel which was considerably cheaper than eating out in town. Breakfast the next morning was one of worst I have had in any hostel on this trip. The cereal tasted like cardboard and wasn’t helped by the warm milk. The coffee was just some brown water. Following this bad start to the morning we got onto a boat and headed for the main part of Venice. First impression: Venice smells a bit odd. First thought: Strange place to built a town. Seems like a lot of hard work to me. Venice is certainly a pretty town, it just isn’t very “cool” and there isn’t much to do other than look around the place. Everything looks the same as well so it’s pretty easy to get lost. We had a terrible map which didn’t really help matters. Imagine you are on Google Maps, search for “Venice” and then zoom out as far as you can. That gives a pretty accurate impression of the map we had. 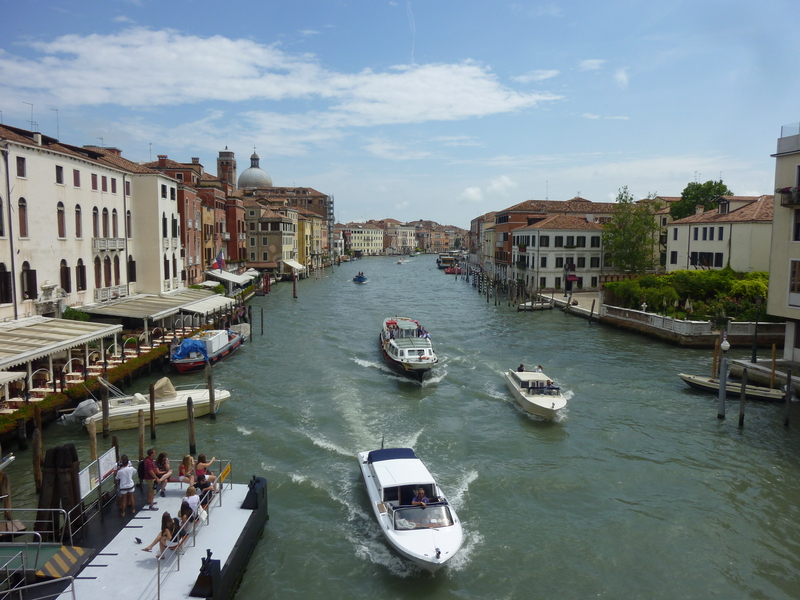 The Canal Grande is the cities main waterway and is where most of the crowds seem to gather. Chris and I walked along it for a while but quite quickly got annoyed by the number of slow walking people. Pushing them into the canal is frowned upon and causes a terrible mess. Once you get away from the main tourist hot spots everthing looks exactly the same. Even with a decent maps it would be pretty easy to get lost as there are no good points of reference. Parts of the city looks pretty dilapidated and like they could sink into the water at any moment. Plenty of buildings are covered in scaffolding, presumably as they are having work done on them to prevent said subsidence. There are hundreds of bars and restaurants but everything is very expensive and nothing really stands out. After a brief stop for a lasagne we did some more walking but got bored pretty quickly and decided to head back to the hostel. The not quite so grand canal. We got on one of the boats which was taking a long route back to Giudecca. This is actually one of the best ways to see Venice as you avoid all slow walking tourists (although the boats can get pretty packed as well). In the evening we went out for pizza and wine at a restaurant next to the hostel. Top tip 1: eating on Giudecca is cheaper than the main island. Top tip 2: avoid drinking beer, it is ludicrously expensive. €6 or more for a “pint” seems to be the norm. The wine is much cheaper and even the cheap stuff is of a decent quality. Back at the hostel Chris and I polished off two more bottles of red (each) and played cards for several hours with our fellow travellers. Concentration and level of skill decreased at a steady pace. Entry filed under: Italy. Tags: Giudecca, Ljubljana, ostello venezia, pasta, pizza, Venice, Villach, Wine. Is it fair to say that you didn’t enjoy Venice? That’s a shame, I have been three times and would gladly go back again. As for beer prices, I was in Rome last weekend and that was just as ludicrously expensive.